Jake Eshelman is a meticulous kind of guy. 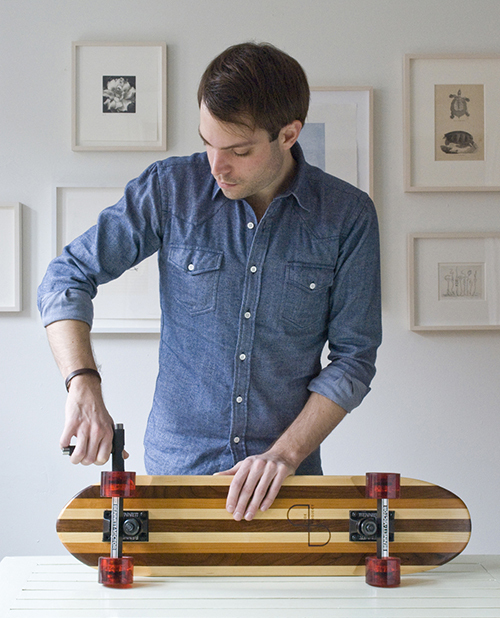 Just check out his wall of tastefully framed art, his tailored shirt and well groomed self...or more importantly, that gorgeous, carefully crafted skateboard he's holding. That perhaps speaks loudest of all. Jake grew up in Houston, Texas, at a time when skateboarders were well traveled on the main and side streets of the city, often barefoot, bold and spirited. It inspired him to craft his first skateboard - and then another...until word got around and he had a good side gig. Now, through his company, Side Project Skateboards, Jake continues to craft one of a kind skateboards by hand in his home town of Houston. Reclaimed Cherry, Maple, Walnut and Ash all make repeat appearances in Jake's shop and he relishes working with the various grains, colors and idiosyncrasies the natural woods provide. I don't have a current need for a skateboard, but if I did, I know exactly where I'd buy it... here.